May is Su-nee’s younger sister. They have the same father, serving a life sentence in Chiang Rai prison, but different mothers. They both lived with their father’s mother in the village before coming to CFPM. 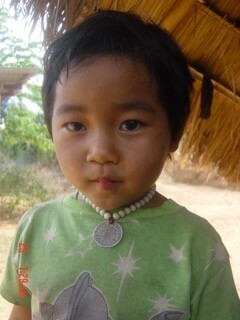 May came to CFPM in Thailand in 2009 when she was five years old. At that time, she couldn't speak Thai at all (she could only speak Akha). She had also never been to school because her family was very poor and didn’t have enough of money to pay for school. I still remember well when I first came to CFPM. I was a little girl, and I couldn't speak Thai at all. I’m very happy to be staying at CFPM and getting a lot of brothers and sisters. I have learned how God takes good care all of us. He is an amazing God. May is a lovely girl and she has a beautiful smile. She like to sing and dance, and she is very friendly. She likes to read books. She wants to be a teacher. Her favorite colors are light blue and white. Her favorite foods are pizza and ice cream. And May says her favorite Bible Story is the birth of Jesus. I like this story because Jesus came to this world to die for our sin. My favorite Bible verse is, 'Ask and it will be given to you; seek and you will find; knock and the door will be opened to you' (Matthew 7:7). This Bible verse is important to me because it teaches me that if I seek Jesus I will find Him and if I open my heart, Jesus will come in.